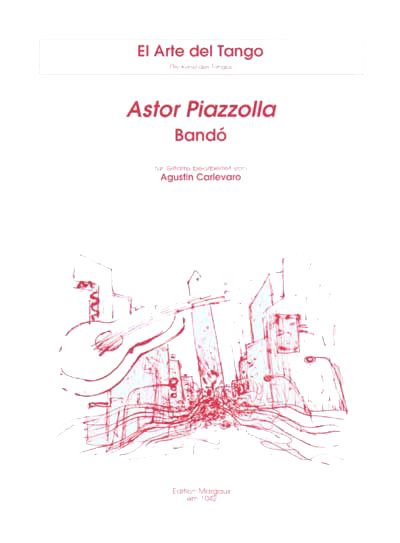 A tango by Astor Piazzolla, arranged for solo guitar by Agustin Carlevaro. Carlevaro's notes tell us: "Generally speaking, the tango was neither conceived nor thought of by its composers as music for guitar solo, their principal medium of expression being small instrumental groupings featuring the piano or bandoneon. Thus, in order to play a tango as a guitar solo, it is necessary to "arrange" it, yet without in any way misrepresenting the original intent of its author. The process of transferring the music to the intimate dimension of the guitar's six strings inevitably calls for alterations to the original score, again always respecting the composer and his message. This process, however, is unavoidable if one's wish is to create music which is idiomatic to the guitar; not as a distortion, but rather as though it had been born naturally in the instrument itself. If this procedure is successful, the music of the tango can be rediscovered through a completely new dimension, and one can sense the creation of a new and distinctive color. The composer's original creation is enriched by the delicateness inherent to the guitar's nature and which, at times, the instrument reveals to us."